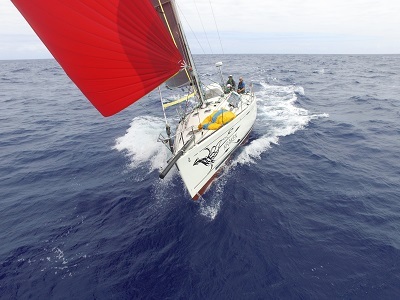 The trade winds got stronger overnight and propelled the whole fleet much closer to Hawaii. They can't quite see it, but everyone aboard will be starting to sense it. And we finally got to see what the performance boats Firefly and Joy Ride are capable of. While Turnagain, Salient and Kraken all had stellar 24 hour runs, the two lead boats legged out by over 30 miles in fast reaching conditions in about 20 knots of breeze. With less than a day before their finish, Firefly has 177 miles to go and is still battling it out for supremacy with Joy Ride who is only 32 miles behing. The next wave of boats includes Salient who is 181 miles behind Firefly, Kraken + 197, and Turnagain +216; followed by Anjo +322, Oxomoxo +377 and the Cruising Class Serenite +372. While Firefly is leading the race for Line Honours and currently expected to finish around sunrise Saturday morning, they owe Joy Ride close to 8 hours of time allowance and Joy Ride is presently correcting in front by about 5 hours for the Overall win. We will see if Firefly has a trick or two still to play. In Racing 2, it is still close to call with Salient, Kraken and Turnagain all expected to finish within a few hours of each other on Sunday morning. This is going to be exciting to watch. For over 50 years Martin Marine has enjoyed catering to the needs of the local boating community. We have plenty of free parking along the side of the building as well as out back.